Dyson cleans up in the boardroom! National audio visual company, Saville Audio Visual has announced the appointment of Andy Dyson (pictured) as commercial director. Andy has over 27 years varied experience working across all facets of the business, starting initially as an apprentice warehouse person in 1986. In the following years he fulfilled various roles within the company in both the sales and hire divisions. 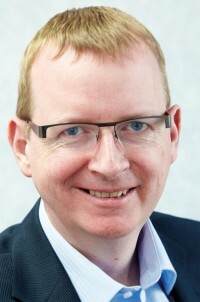 In 2009 he was appointed to his previous role as divisional manager for the AV/IT systems division. Under his leadership the division has seen an increase in turnover of over 30%. Andy’s extensive experience within the AV business will add a new dimension to the board, helping to establish further growth for the company in the future. Commenting on his appointment Andy said: "The company has been a large part of my life for the last 27 years. I am immensely proud to be appointed to the Board and I am looking forward to being part of the future growth and development of this long established business." With twelve centres nationwide and a rapidly expanding international profile, the company has grown to become the longest established specialist AV company in the UK winning over 28 national awards.